Officials from the Air Force Life Cycle Management Center’s Acquisition Environmental and Industrial Facilities Division at Wright-Patterson AFB, along with NRG Solar Oasis LLC representatives signed an Enhanced Use Lease agreement in February 2015 allowing NRG to complete installation of approximately 98,000 photovoltaic solar panels such as these on 180 acres adjoining Air Force Plant 42. One hundred sixty acres of the project site are on Air Force owned property. 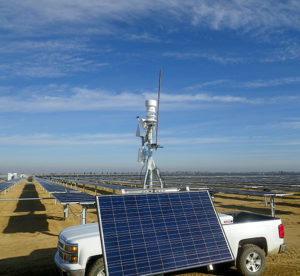 The Air Force Life Cycle Management Center at Wright-Patterson Air Force Base, Ohio, has spearheaded an effort to generate alternative energy for the southern California market and generate revenue for Air Force Plant 42 in Palmdale, Calif., through a unique Enhanced Use Lease agreement with NRG Solar Oasis LLC. The project was jointly funded by both NRG Energy, Inc. and its subsidiary NRG Yield, Inc., through a previously announced partnership between both companies. Officials from the Acquisition Environmental and Industrial Facilities Division at Wright-Patterson AFB along with NRG Solar Oasis LLC representatives signed the lease in February 2015 at no cost to the Air Force. NRG has since completed installation of approximately 98,000 photovoltaic solar panels on 180 acres adjoining Air Force Plant 42. One hundred sixty acres of the project site are on Air Force owned property. A photovoltaic system is a method of converting solar energy into electricity using semiconducting materials. The solar plant will provide 20 Megawatts of electricity, making it among the largest single solar projects undertaken on Air Force property. Twenty Megawatts is the amount of electricity required to power approximately 3,280 homes. The project will avoid 41,000 tons of carbon emissions, equivalent to taking 8,600 cars off the road. The Acquisition Environmental and Industrial Facilities Division is part of AFLCMC’s Agile Combat Support Directorate, while the company is a subsidiary of NRG Energy, a New Jersey- and Texas-based Fortune 500 power generating firm. The agreement provides AFLCMC lease revenues over the next 20 years in exchange for NRG’s rights to install solar panels on Plant 42 land and sell the generated electrical energy to public utilities in southern California. The agreement has two additional five-year options which, if exercised, would extend the partnership to 30 years. “The Air Force is pursuing innovative solutions by partnering with industry to develop renewable energy sources on underutilized land,” said Lt. Gen. John Thompson, commander of the Air Force Life Cycle Management Center. “Budgetary constraints are motivating Air Force installation and community partners to re-evaluate the way we do business and seek alternatives. When leveraging installation and community resources, savings and economies of scale can be achieved,” he said. Plant 42 is a U.S. government aircraft manufacturing plant. It supports NASA operations and is home to several large contractors including Northrop Grumman, Lockheed Martin and Boeing. The Air Force property used for the solar project previously contained an Air Force firing range and a sewage treatment plant. The property was environmentally remediated by the Air Force before development of the solar project. According to Jared Scott, Industrial Facilities branch chief, the lease is the culmination of a herculean effort among multiple agencies to develop efficient, effective solutions for renewable energy while maximizing the utilization of Air Force owned real property. Frank Tokarsky, community planner for Air Force Industrial Facilities, explained that the Air Force and NRG evaluated and assessed the potential environmental impacts associated with the proposed solar development. An Enhanced Use Lease is a lease, or out-grant, between the Air Force and a public or private interest willing to pay rental value or in-kind consideration for the use of the Air Force’s non-excess real property. 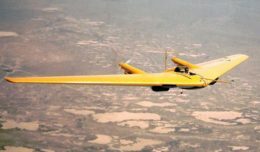 Energy EULs encourage the development of renewable energy — helping the Air Force save money while meeting congressionally established Air Force renewable energy goals. The project is located north of Columbia Way (Avenue M) and west of 30th Street East. AFLCMC will oversee the EUL. Lease revenues will help maintain the Air Force’s industrial plant properties. The 412th TW will continue to provide base operating support and airfield management functions to Plant 42.